R is for Ronnebeck! : I see my way down Home!!!! I see my way down Home!!!! In retrospect... I'm so glad that we went and "invaded" our home last summer when I was there to visit. Shannon, Erica, Eric and I drove down the driveway, looked at the buildings, and enjoyed our scenery. We told stories, and pointed out the trees we planted, and where trees should be that we ran over with the lawn mower (Sorry Mom!). It left an aching in my heart for this place, this home is what I think of when I think Home in South Dakota. I mused with Eric that If we were millionaires we'd buy this place and use it as our "vacation home". This is the one place that holds all my happy memories from my childhood.
" I See my way down home!!!!" On each occasion that I've visited South Dakota in the past 8 years, I've made a trek to this home to see it. Just to enjoy it. I'm so glad I got to share the place with Eric, and not have to rebuild it from my memories for him. I even got to ride Spanky one last time! It has been inhabited by someone for quite some time, we sold our farm when I was in 6th grade. We moved to "The City" of Watertown, and left Home behind. For so long, someone lived here, and cared for it. For many years it was their home too. Now, they've decided to move on, and build a new home for themselves, and sadly, that means this one had to go. I cried real tears when I saw this, and spent most of my night revisiting the photo. 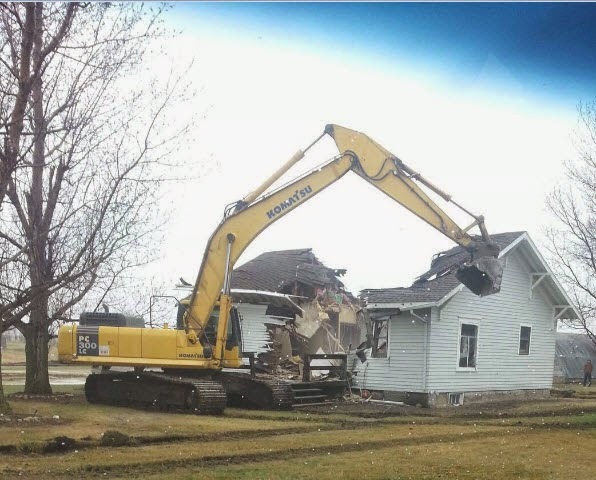 I know that the memories aren't physically held in this home, but it's still hard to see it go.